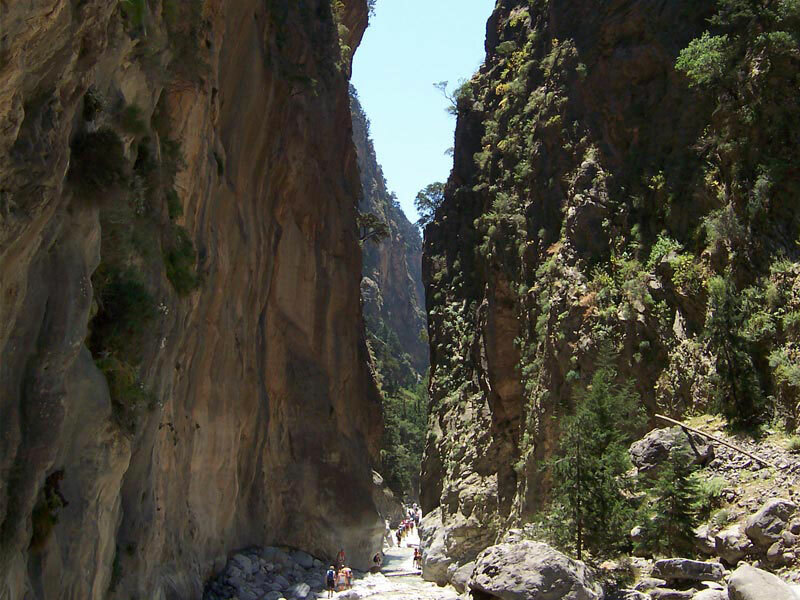 Samaria Gorge is one of many beautiful gorges in Crete and one of the places you should visit on your Crete holidays. The gorge has a length of 16 km, starting at an altitude of 1,250 m., in Xyloskalo and ending on the shores of the Libyan Sea in Agia Roumeli. It is quite long (4 to 6 hours hiking), so you should be prepared for a quite rough route. 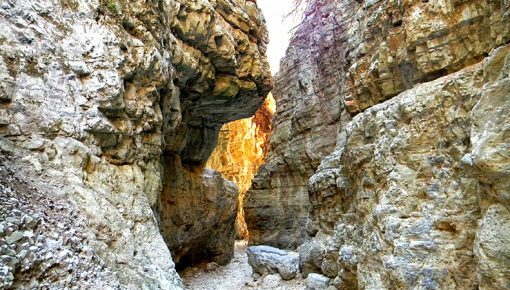 The gorge was declared as a national park in 1962 mainly because it is a shelter for the rare Kri-Kri (Cretan Ibex). 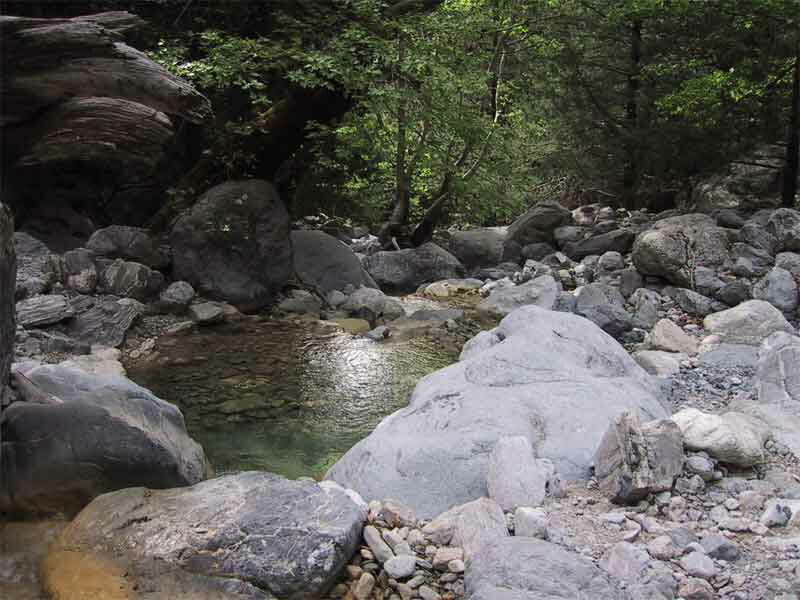 Samaria Gorge has also a variety of several rare endemic species as well as many species of flowers and birds. 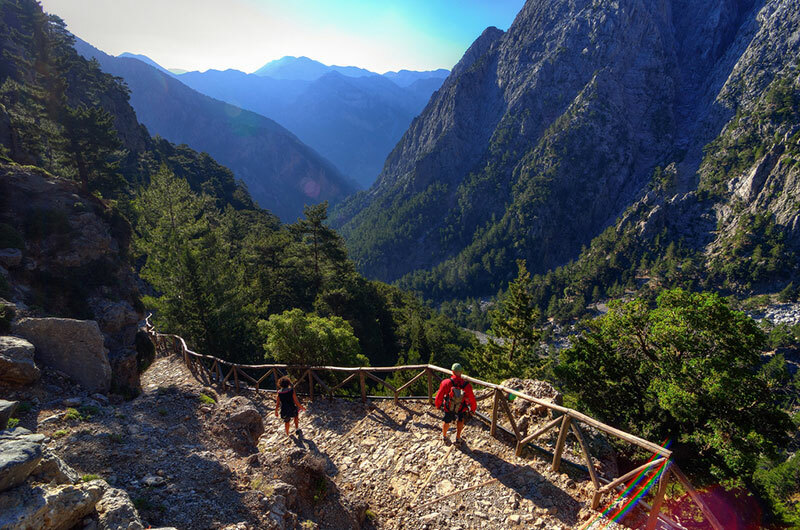 1) The most common way to reach there is to book an guided Samaria Gorge tour. 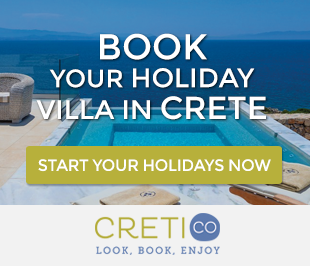 There are tours organised in most big cities and resorts of Crete. The main advantage of those tours is that you don’t have to organize anything regarding booking tickets (included in the price), checking bus itineraries, e.t.c. The buses are air-conditioned and you have the benefit of a guide. This does not mean that you have to walk in a group: everyone walks at their own pace and meet at a prearranged time and place in Agia Roumeli. 2) If you don’t want to book an organised tour, the second most convenient choice is to get to the Public Bus Service (KTEL) and get one of the buses going to Omalos from Chania every morning (only when the gorge is open). Once you end your hike and reach Agia Roumeli, you get the boat returning to Chora Sfakion, Sougia or Paleochora. From any of these regions, you may take the bus back to Chania again. Check here the timetable of the Public Bus Service (KTEL). – You leave your car at Xyloskalo, cross the gorge until Agia Roumeli and then, return back again, through the gorge to get your car. We would not recommend that option, as you will be really exhausted. 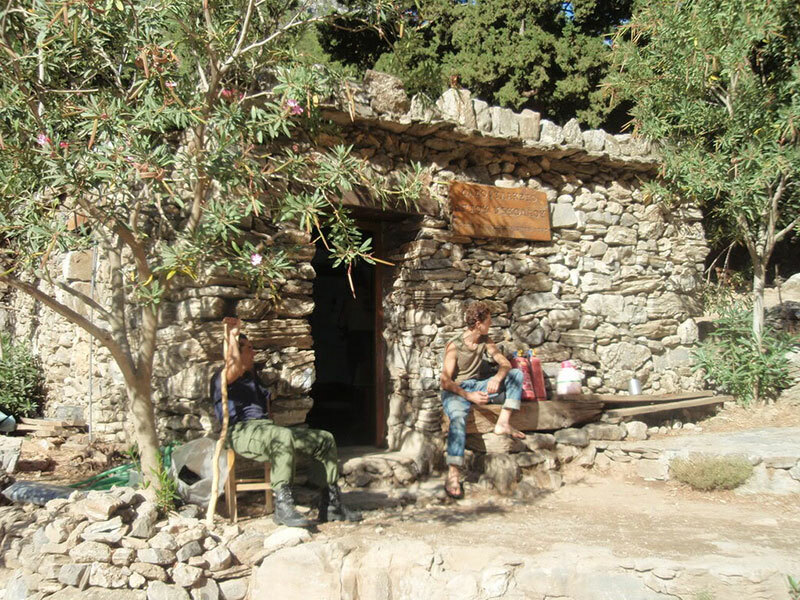 In Xyloskalo, you will find the entrance of the National Park of Samaria, as well as the ticket office. The ticket costs 5 Euros. Entrance for children until 15 years old is free. You should hold your tickets until the way out where there is a ticket control. The hike in the gorge is permitted from mid-April until the end of October. There is no exact date that you will find Samaria open. It depends on the weather. In case of a heavy rain, the entry to the public may be forbidden in order to avoid accidents from falling stones or overflowing of the river flowing through the canyon. Entering the gorge, there is a steep rocky trail with a wooden fence for you to lean on. This path is about 3km. This is the most difficult route into Samaria Gorge, as it is downhill enough. After 1.7km (40 min. hiking) you will see the first rest point called “Neroutsiko”. There you will find a fountain with drinking water, fire station and toilette. In the next 1.1km (25 min hiking) there is the rest point “Riza Sykia”. It has also a fountain with drinking water, fire station and toilette. Moving on, you will see the river that crosses the gorge and you will hear its gurgling water on your way there. Also, around the trail you will definitely notice large areas covered with stones stacked on top of one another. It is said that if you stack a rock on top of them your wish will be granted! In the next 0.9Km (25 min. hiking) you will find the rest point “Agios Nikolaos“, where you can make a five-minute stop if you want. 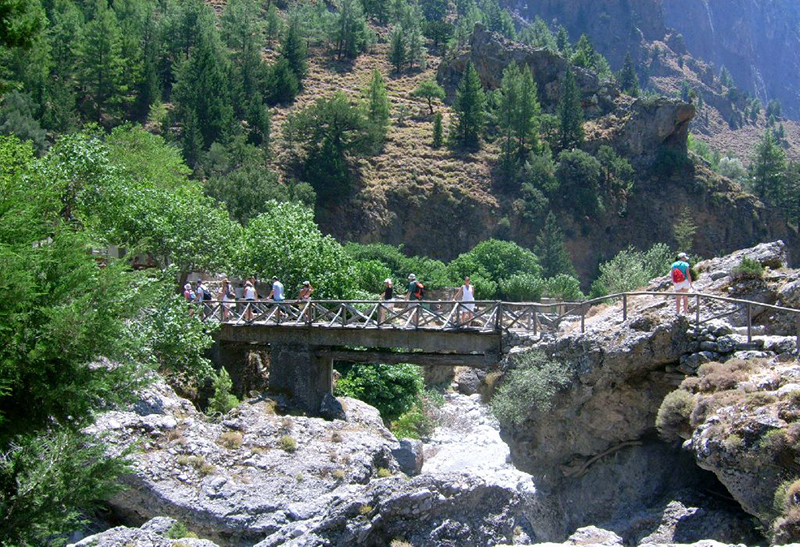 You have already traveled the first 3 kilometers in Samaria Gorge! In Agios Nikolaos you will find a fountain of drinking water, fire station and toilette. Here is the forester’s building and a very old church of St. Nicholas (open to access). From now on, the path is not downhill, but a little steep, full of stones. Continue towards the fourth rest station (20 min hiking), the “Vrysi”. Here you will find only a spring of water. The next stop for water turns to the rest point “Prinari” after 1.3km (20 min hiking). 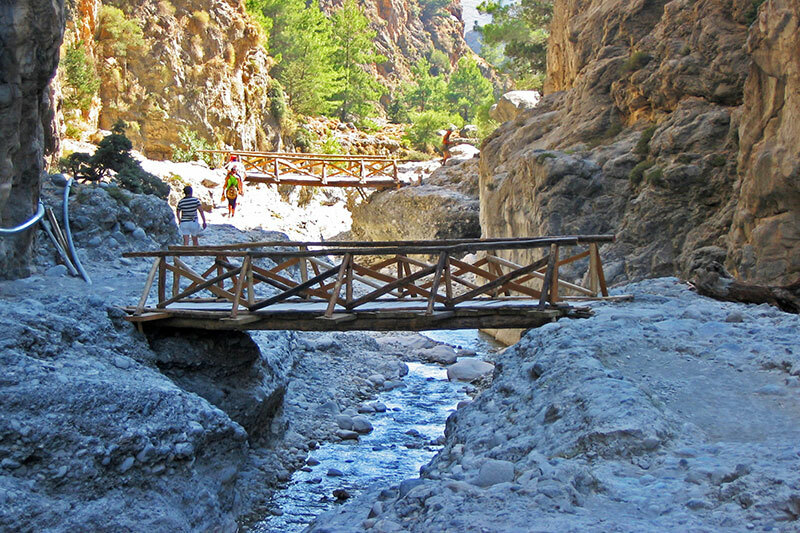 After 1.2km (25 min hiking), you will find an impressive wooden bridge leading to the rest point “Samaria”, in the old village of Samaria. You’ll see quite a few abandoned stone houses, which formerly hosted the village residents, but also many rebels during the struggle against the Turks and the Germans. It is located in the middle of the gorge and is the biggest rest area, with wooden benches, and tables, in case you need to eat something! Here is the First Aid station. In Samaria village there are also a fountain of drinking water, fire station and toilette. After a rest in the village, you start again and will definitely be surprised seeing how many olive trees are near the village! You’ll also notice many stone benches on croplands indicating the human presence. A little bit further you will find another church (locked unfortunately), but also the family tomb of Kalogeraki Brothers. Completing the next 1.1km (20 min. hiking), you will cross another wooden bridge in order to reach the rest point “Perdika” (partridge). There is also a fountain of drinking water there and a fire station. Continuing on to the next station, you will definitely enjoy crossing small bridges over the river. You will notice beautiful geological shapes on the rocks. Completing the next 2,2km (45 min. hiking), you will reach the last rest point, the “Christos” (Christ). Here you will find an old church, fountain of drinking water, fire station and toilette. After “Christos”, continue for the last 2.8km (30 min. hiking) and you will get to the impressive “Sideroportes”, or simply “Portes”. This is the narrowest point of Samaria Gorge. The distance between the two sides of the gorge at this point is only three meters and their vertical height reaches 300 meters, a perfect spot to take some majestic photos! Then, you will see two parallel bridges, in a short distance from one another, a building for tickets checking and… that’s it! If you walk leisurely, stop for taking photos and rest, you will spend 5 hours approximately. If you want to walk a little more strongly it will take to you about 4 hours. If you want to be very relaxed, sit and eat in Samaria village, then it may take to you 6 hours approximately. In case of injury or exhaustion, you don’t have to worry! The foresters riding cute donkeys are there for you to take you to the exit of the gorge. 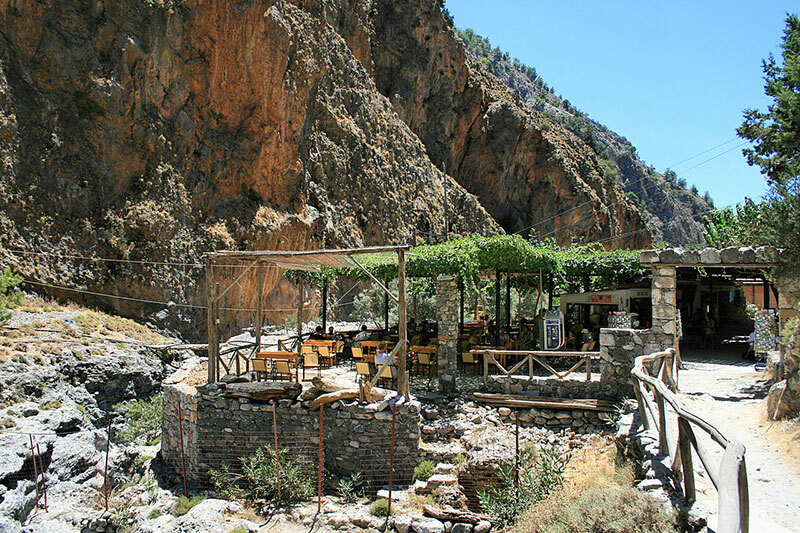 Coming out of the gorge you will see three cafes where you can sit and have a refreshing drink, an ice cream or something to eat. Then you can walk another 3 km towards Agia Roumeli. Alternatively, there is mini-bus service! In Agia Roumeli you will find several restaurants offering delicious food and iced orange juice. You may also enjoy a swim at the pebble beach there. 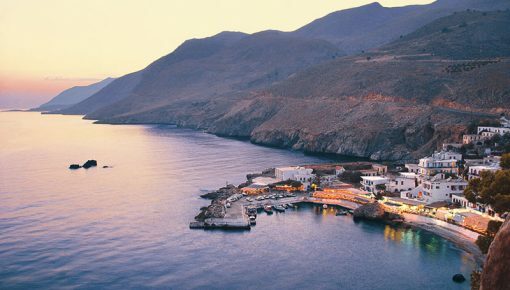 Then you will get to the ticket office of ANENDYK in order to buy a ticket to Loutro, Sfakia, Paleochora or Sougia. If you are willing to spend a night in Agia Roumeli, we recommend you to enjoy the beautiful sunset until late on the beach and then taste the delicious Sfakian pies and Cretan wine in one of the traditional taverns. In the next morning, do not forget to taste breakfast with Sfakian cheese and thyme honey from the White Mountains. Bring any kind of fruit and vegetables or a light snack, enough to fill you up on your way. As for water, you may bring in your backpack a bottle to fill it at each rest point. If you walk leisurely, stop for taking photos and rest, you will spend 5 hours approximately. If you want to walk a little more strongly it will take to you about 4 hours. If you want to be very relaxed, sit and eat in Samaria village, then it may take to you 6 hours approximately. Wear a white T-shirt, a hat and don’t forget your sunblock. 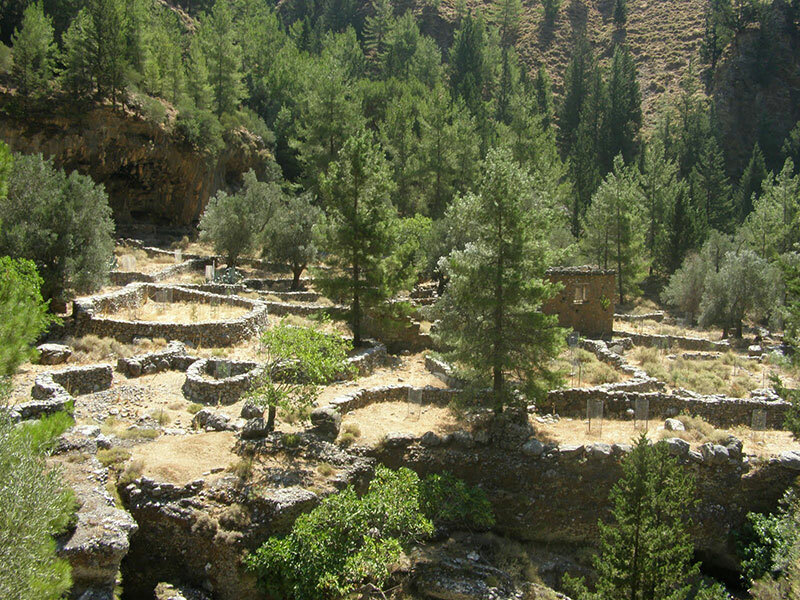 Especially after passing Samaria village, there are no trees along the trail to protect you from the sun. Wear soft sneakers with notched soles. They are essential so as not to slip on the steep path. Also, be aware of wearing thick athletic socks. 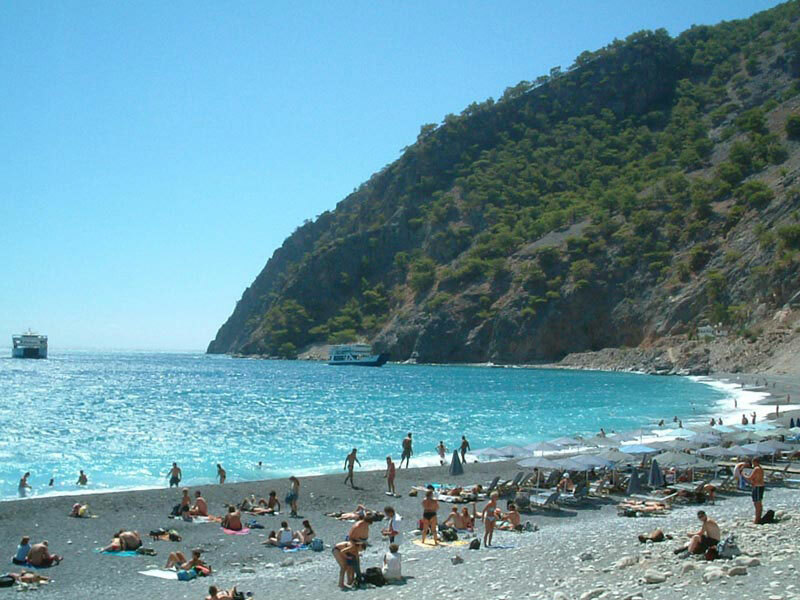 Beach towel, slippers & swimwear in case you want to swim in Agia Roumeli beach, after coming out of the gorge. Climbing canes will be useful for the first 3 km. In the gorge, you will encounter unique species of plants and animals, protected by international conventions. It is reported that, in the gorge, are 450 species of plants. According to the law, visitors are not allowed to take anything from the Samaria area, not even a flower. 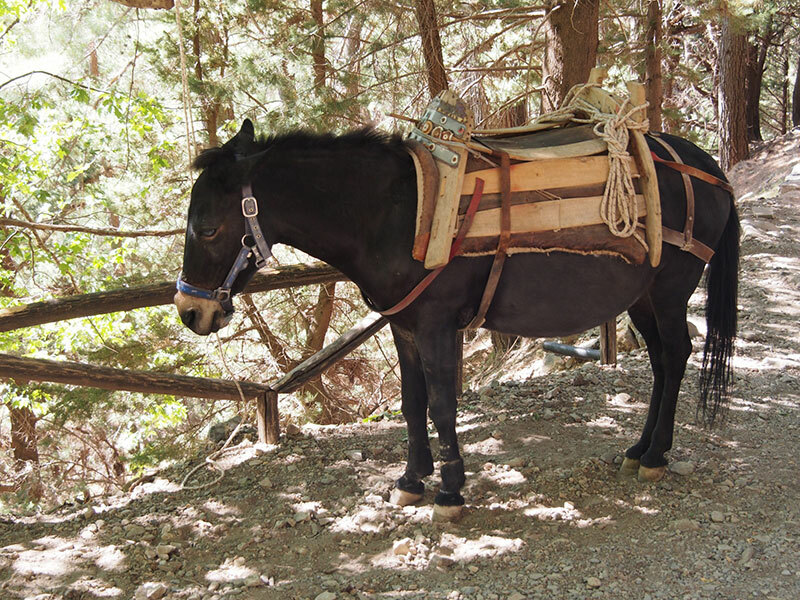 In Samaria, you can admire the forest with the huge pines and cypresses, as well as their famous inhabitants, the wild goats of Crete, Kri-Kri. The wild goat is endemic to Crete and you will probably meet them in the village of Samaria. Posted on 29 Jun 2015 in Trip Ideas and tagged Beaches In Crete, Cretan Gorges, Hiking In Crete, One Day Trips In Crete, Samaria Gorge.